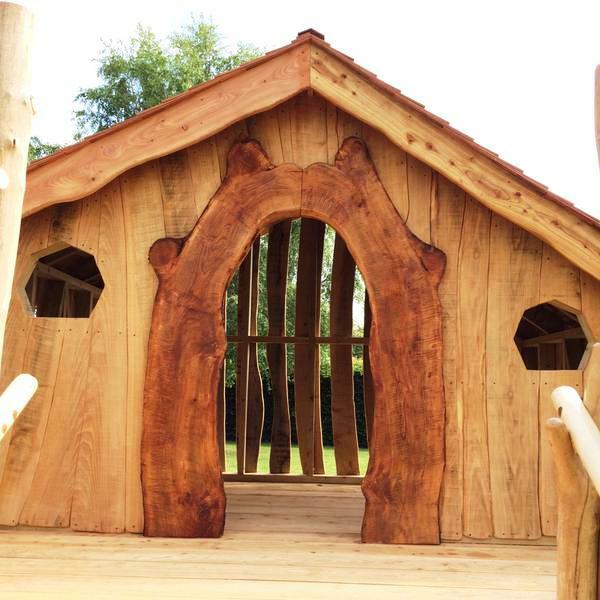 This tree house play structure is designed for nursery age children all the way up to adulthood. The staircase, handrails and spindles are built to be suitable for all ages following safety regulations specifications. We really wanted to create as much of a woodland environment as we could for the children, using the waneyest branches we could find. Building a tree house where no trees stand was always going to be a challenge, and one that we thoroughly enjoyed! It is built with sweet chestnut and stress graded pine for the structure. It has a larch floor and staircase, and a cedar shingle roof. All of the braced uprights have oak pegs through the sweet chestnut joints. Read the testimonial for this project here.